And if you sit there for some time, you experience continuous cycles of violent whooooshss followed by mild Sussshsss..then again wooooshh.. and then susssshhh…Amid these you are busy - happily building home like structures in the weak sands on the beach. That, I think is Life! Ahaa ! so you were in Mumbai ? What all you could see ? 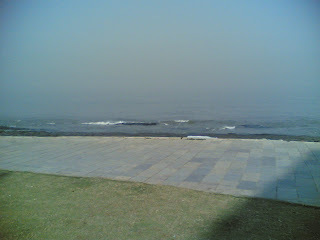 Here you can have a look at Marine Drive also. Just posted them. :) I too have some pictures of Bandra, maybe some other time. @cuckoo: ya.. was in mumbai..
i have been to marne drive, hanging garden etc earlier. though not this time..
and yes.. traffic in delhi is much much better! !